Here's to a crafty New Year! Now that the year is soon coming to an end, it's time to quiet down a bit, digest those Christmas treats, and get ready for some new crafty endeavors in 2015. Of course I have been secretly planning ahead and I can already promise that next year will be filled with lots of crafty fun on my blog. Want to find out a bit more? Here we go. Austrian Etsy has developed to one of my favorite features since I started it last spring and while it was a bit of an on-off kind of schedule in which I posted, this series will now get its spotlight every Tuesday. Picture Perfect is an all new photography feature taking pride of place each Saturday and loosely linking to my failed Project 365 which I broke off during fall as posting a photo a day had become too much of a chore instead of a fun adventure. There will also be a handful of other features mingling on Thursdays. Once a month I'll be giving you updates about my Adventures in Postcrossing as well as taking a look at what's new on the book horizon in The Crafty Bookpile. Strewn in for good measure I will be showing off my Etsy hauls in The Lucky Dip. The monthly giveaways also received a bit of an overhaul though I won't give away too much now regarding the goodies you may win. Not yet anyway. Excited much? I sure hope so. See you all in 2015! What will you get? It's a mystery! At a dollar, what do you have to lose? Any item sold or once sold in the shop may be included in this order. This item can be purchased on its own or in addition to other purchases. Call me a skeptic, but I'm usually a bit weary when it comes to $1 bargains. Yet the worst that can happen is loosing out on a buck, right? I ordered five of these mystery items, due to curiosity and to make the most out of the shipping cost. Lo and behold the bounty I found in the envelope! 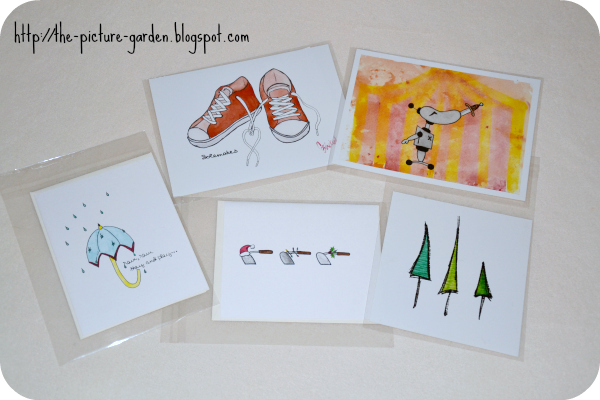 Two greeting cards and three art prints all of which are adorable and, as it goes without saying, offer such great value. This is not just a fantastic way to get to know different stuff from the shop, but perfect for stocking up on stocking stuffers too (Christmas card already included)! Would you be able to resist a 1-Dollar bargain? Are you like me, already stocking up on lil' gifts throughout the year to be given at Christmas? And which of the shown cards/prints is your favorite? Time for a little confession. This time I scheduled the monthly post as, for a change, it's not a whole lotta postcards travelling but yours truly. Obviously this means I won't be able to present you all the cards that arrived during the past few weeks, but I'll catch up next time. As not to bore you and knowing fully well how everyone likes to feast their eyes on pretty pictures I thought I'd share with you the second most important thing of sending postcards. It goes without saying, but first you need the card. Then you need the stamp. All followed by some not-to-be-bragged-about aka bloody awful penmanship. Plus a trip to the nearest mailbox. But let's not get ahead of ourselves now and enjoy some of the stamps I recently purchased. Most are special issue stamps and while I've been wondering at first why there only seem to be such stamps available for Europe I only found the ones for sending mail overseas after sending off the order. *drops head on desk*. Well, there is always a next time! The pink ones showing St. Stephen's Cathedral and the Viennese Ferris Wheel are standard issue stamps for Europe and International. Personally I'm not too happy about the modern depiction of these famous sites, but oh well. 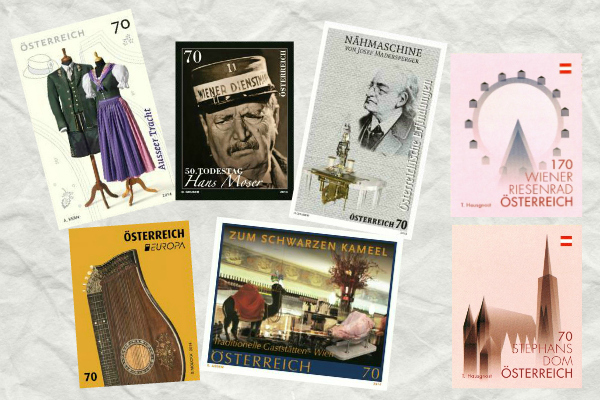 And then there are several special issue stamps, which traditionally seem to be commemorating various historical events or simply present something typical Austrian (yes, I own a Dirndl too, more of a modern style though). My personal favorite is probably the one showcasing Josef Madersperger, one of the inventors of the sewing machine. Crafty much? I think so too. How do you like these stamps from Austria? Are stamps something you care about or notice when receiving a postcard or letter? Let me know! The Lucky Dip - Idlewild Co.
Where to go? 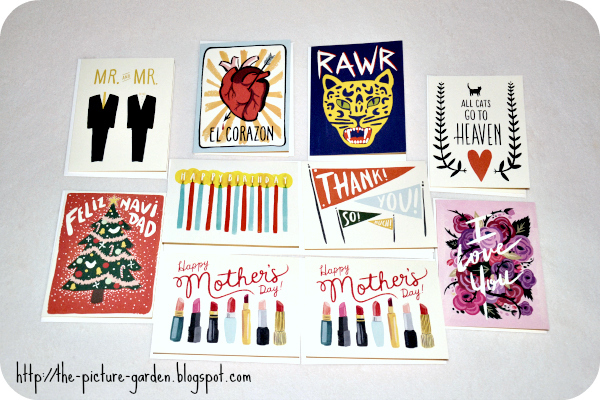 Idlewild Co.
Get (5) or (10) of our hand-painted assorted greeting cards & envelopes in our black and white striped grab bags! Each grab bag is unique and contains current and discontinued Idlewild Co., or Rocket Ink designs. Design themes include but are not limited to: Birthday, Seasonal, Wedding & Baby, Hello, Thank You, and Sympathy/Support. All grab bags are pre-assembled, but will include a varied assortment of categories. Please note that in order to meet this discounted pricing, these cards are contained in our Black and White grab bags–not individually wrapped. Apparently I'm in the mood to fill up my greeting card drawer and evidently Etsy is a treasure trove for doing that. The first thing I noticed when I opened my grab bag was the amazing quality of the cards. Thick card-stock, vivid colors, and a great mix of different designs. Yet there was one downside too, namely finding a duplicate in the lot. That wouldn't be so bad if it were, say, a birthday card, but as you can see it's the one for Mother's Day. Bit of a bummer, really. Despite that, I'm more than pleased with my paper goodies! Are you keeping your card drawer stocked too or do you usually buy cards only when you need them? Do you prefer to send/give different cards to people or will you resort to the same design for everyone for eg Christmas? And which of the cards above do you like best? Let's bring this year to an end with some reading material that sparks the crafty imagination. Those of you who've entered previous giveaways since September may skip the following lines in which I will once again repeat that I'm also book blogging over at The Book Garden which explains my sharing of these bookishly crafty prizes. 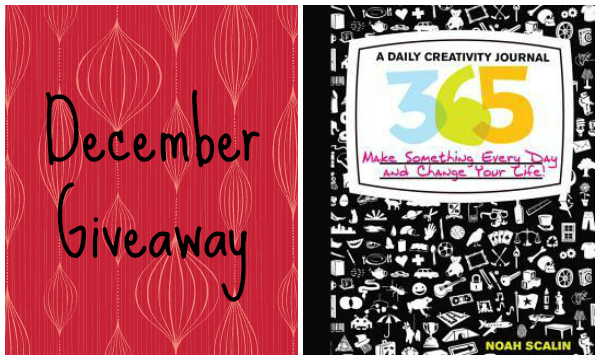 In this month's giveaway you can get your hands on 365: A Daily Creativity Journal: Make Something Every Day and Change Your Life! by Noah Scalin! Congrats to Penny L. from Canada!